So you’ve probably heard all about contouring, which is using light and dark shades of make-up to define and enhance the structure of the face. ‘Strobing’ is the hot new trend that is the beauty buzz word of the moment – all the beauty magazines are talking about it. Strobing is being dubbed the quicker, “anti-contouring” technique that adds intense highlights to the areas where the light naturally hits, without the need for complicated use of powders or adding dark shadows. 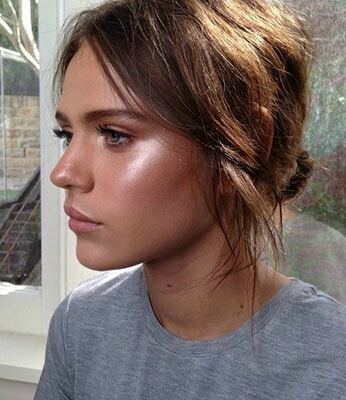 This look is all about looking dewy, glowing and healthy as if “lit” by professional lighting. I am a Professional Freelance Makeup Artist, and a Wedding Makeup Artist, and this look will look great in your wedding photos (see how the light hits Jennifer Lopez’s cheeks in this photo – amazing!) More mature ladies need to choose flattering cream or liquid highlighters, avoiding glitter particles that will draw attention to fine lines. What products to use for ‘Strobing’? 1. Ariane Poole’s Luminizer – this stick highlighter is so easy to use, simply draw on and blend. It has a gorgeous texture. Buy now. 2. Becca’s Shimmering Skin Perfector – comes in several colours, liquid highlighters. 3. Benefit’s High Beam – pink tone, comes with a brush like a nail varnish so easy to apply. 4. L’oreal Paris Lumi Magique – white highlighter that adds a beautiful glow to the skin. Good luck ladies! If you need more help with your make-up or think you would benefit from a Makeup Lesson with a Professional Freelance Makeup Artist / Wedding Makeup Artist. Please do feel free to contact me at www.melenglandmakeup.com.